This weekend, I did just that. I knit rows between going to the other room to retrieve the kid. Saturday morning, I got up early and went to a garage sale where I scored a ton of clothes for the kid for pretty cheap. Conveniently, the garage sale was located close to one of my favorite area yarn stores! So, while we were on that side of town, I stopped in to pick out some yarn for my sister’s wedding shawl. The wedding is in less than three weeks. Yep, cutting it close on this one! I didn’t find the yarn I went in looking for, so I asked the person working there for her recommendations. She was great! She helped me pick out some RYC Cashsoft 4 ply and gave me the great suggestion of incorporating some beads along the edges. 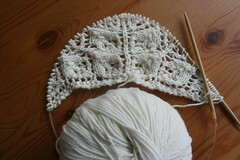 So, this weekend I cast on for the Flower Basket Shawl. I’ve made it farther than the picture indicates because I worked on it some tonight, too. I’ve discovered that I can get some good knitting in between trips to retrive the crawling kid. Granted, there is some unravelling that has to occur every once in a while since I get interrupted, but I’m hoping I’ll be able to learn the pattern and see when I’ve made a mistake. The knitting mojo has returned! FBS is a great easy lace pattern. You will get the repeat quickly. Oh yeah, crawling kids. Remember those days. Ever think about using baby gates to keep him in? Hooray for the return of the mojo! Good luck with the shawl. welcome back to the mojo! i loved working on the flower basket shawl. great pattern. Glad your Mojo is back… I’ve gone through those periods, too. Usually it’s until I find a pattern I just HAVE to knit! The lace looks lovely!